Penn State Graduate Program in Acoustics, State College, PA 16804. Faculty of Engineering, University of the West Indies, St. Augustine, Trinidad. Fundamental Fuel Properties Group, Idaho National Laboratory, Idaho Falls, ID 83415. Westinghouse Nuclear Services, Harrison City, PA 15636. An acoustic heat engine that takes advantage of the harsh operating environment (e.g., high-energy particle fluxes) and high temperatures produced in nuclear reactors and spent-fuel pools can sense and telemeter temperature, gases, and neutron fluxes by generating sound that would radiate to the exterior of the pressure vessel and thus create an inexpensive self-powered sensing system. Just over three years ago, the Tohoku region of Japan experienced the strongest earthquake ever recorded in that country. That earthquake, in conjunction with the tsunami, resulted in considerable damage across Japan, including sever damage to three Fukushima Dai’ichi nuclear power reactors. Not only were there failures of the nuclear reactors, and boil outs of the spent-fuel pools, but the tsunami also disrupted the electrical power connection to the nuclear reactor and rendered the back-up electrical power generators, coolant pumps, and sensor systems useless. This created a situation where the nuclear plant’s operators were unable to monitor the condition (e.g., temperature) of the fuel rods in the reactor and spent-fuel in the storage ponds. These events highlighted the need for self-powered sensors that could transmit data independently of electronic networks. The field of thermoacoustics, which exploits the interaction between heat and sound waves, offers an attractive solution. A thermoacoustic engine produces high-amplitude sound from heat. A thermoacoustic device contains no moving parts and does not require external electrical power if the heat is available, such as that from the fuel in a nuclear reactor. The physical components of a thermoacoustic engine can be as simple as a closed cylindrical tube (e.g., the fuel-rod itself) and an entirely passive structure known as a “stack.” The stacks in our devices are made from a ceramic material with a regular array of parallel pores that is manufactured as the substrate for catalytic converters, found in most automotive exhaust systems. 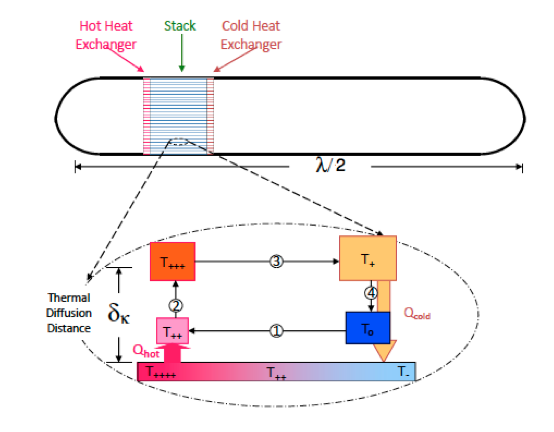 The stack facilitates the transfer of heat to the gas in the resonator in a way that encourages the conversion of that heat to high-amplitude sound when there is a sufficient temperature difference along the stack. This process is illustrated schematically in Figure 1. We built a laboratory version of this device, shown in Fig. 2, and simulated the environment of a nuclear reactor using an electrical resistance heater, much like the wire that glows in a toaster. The cylindrical tube of the thermoacoustic engine was manufactured by the Idaho National Laboratory  (INL) from stainless steel that could withstand reactor temperatures, and having the same dimensions as a nuclear fuel rod. This tube was instrumented with pressure and temperature sensors and a ceramic stack that provided 1,100 parallel square channels per square inch. Heating was applied in two ways: an indirect method, which would be how the thermoacoustic engine would actually be used in the nuclear reactor, and a direct heating method in which there was more control over the heat source. Figure 2 shows the “fuel-rod” thermoacoustic engine and the direct electrical heating element. Figure 2. (Background) The cylindrical metal tube (resonator) used as the thermoacoustic engine is manufactured from Nitronic 60 stainless steel at INL. The larger-diameter PVC end on the resonator protects an instrumentation plate from the surrounding water. The plate contains sensors that measure gas temperatures and pressure (both static and acoustic). (Foreground) An electrical heater (glowing red) made from Nickel-Chromium wire, like that in a toaster, acts as the laboratory version of a heat source. It is placed in contact with the stack, which consists of a ceramic that has 1,100 parallel channels per square inch. The wires leaving the stack are the leads for two thermocouples that measure the temperature gradient across the stack. During the experiments, the electrical heater and stack are placed within the resonator and the entire system is submerged in water, as it would be in a nuclear reactor. The high temperatures produced by the nuclear fuel rods or the spent-fuel will create a sufficient temperature gradient across the stack to create an oscillating pressure wave within the engine. The frequency of the sound will be dependent upon the temperature within the resonator (i.e., fuel rod). This frequency can be propagated via sound radiation through the cooling fluid in the reactor and monitored at some distance away. This novel technique eliminates the dependence on electrical power for signal monitoring, while actually taking advantage of the extreme operating conditions within the nuclear reactor. 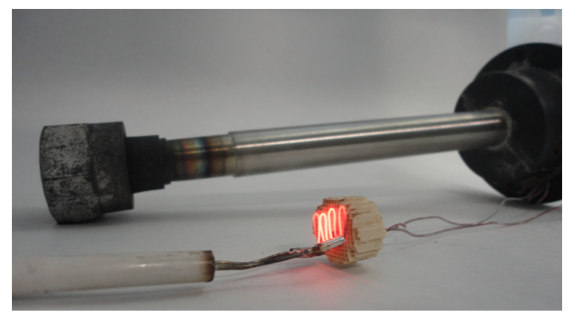 Thus far, we have demonstrated that our thermoacoustic sensor can measure temperature and changes in the gas mixture (e.g., Xenon and Krypton) trapped inside the fuel rod by encoding these effects as changes in the sensor’s resonance frequency. We have also observed frequency and amplitude changes caused by the opening of pores in a porous metal plug included in the fuel-rod resonator to simulate crack formation in the nuclear fuel elements. Data from these experiments and their interpretation will be presented at this meeting. Since the intensity of the sound generated in the resonator is proportional to the heating power applied to the stack, we plan to test a sensor in the Breazeale Nuclear Reactor, on the Penn State campus, to determine if we can also measure changes in the thermal neutron flux from the reactor core based on the changes in the amplitude of the thermoacoustically generated sound. We will present preliminary data at this meeting that demonstrates a very linear correlation between the rate of heating and the square of the acoustic pressure amplitude within the resonator, above the threshold for onset of thermoacoustic oscillations. The funding for this work was provided by the Idaho National Laboratory. Randall Ali’s participation in this research was funded by a Fellowship from the US Fulbright Commission and the Organization of American States. J. W. Strutt (Lord Rayleigh), The Theory of Sound, Vol. II (Macmillian Co., 1896; reprinted Dover, 1945) §322. Idaho National Laboratory (INL) is a science-based, applied engineering national laboratory dedicated to supporting the U.S. Department of Energy's missions in nuclear and energy research, science, and national defense.